Chinese New Year - Year of the Rabbit! Happy Chinese New Year! It's the year of the rabbit this time around. How auspicious! My annual New Year's cards to friends and family aren't in the mail quite yet...they usually coincide better with the Chinese New Year more often than not, though if I planned for that intentionally I suspect they'd not go out until April! 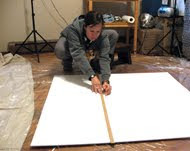 I have lots of plans for 2011, but first, my studio is undergoing an inconvenient but very necessary remodel....which is throwing some chaos and distraction into my creative activities. I couldn't put this off any longer, though. The 1960s discolored pressed paper tile ceiling, wood paneling, stinky deteriorating fiberglass insulation, and color-bleeding red linoleum tile floor were all mid-century retro, but only in a bad kind of way. We found mud wasp nests and a bird's nest in the ceiling when we pulled down the tiles. Nice. We'll be adding numerous ceiling lights to replace the currently zero ceiling lights. This will be good - I just wish it would magically remodel itself in 2 weeks, not several months.